The revolution of media is fascinating in the way new technology is constantly changing the way we communicate and develop relationships. Clay Shirky thoroughly demonstrates how the media of the 20th century was limited with tools such as the printing press and broadcasting, until the introduction of the internet. The internet has forever changed the way we look at media and produce it. Shirky explains that the every day consumer also becomes a producer. The internet went live to the entire world on August 6th 1991. It was a game changer in many ways. It was at this time that we had access to communicate with each other; peer-to-peer and groups. The internet is the central access point for people to talk with each other and share information broadly amongst each other. Shirky’s TED Talk he states,“The internet is the first medium in history that has native support for groups and conversation at the same time.” Technology would now allow you to place calls, take photos, record video, and surf the web interchangeably. When there are multiple access points introduced to complete a task, the experience becomes increasingly more social. It is evident here that the ability to share content on the internet has rapidly increase. While peer-to-peer communication is not forgotten, its social impact diminishes when produced. Whereas the phone gave us the one-to-one pattern. Television, radio, magazines, books, gave us the one-to-many pattern. The Internet gives us the many-to-many pattern. As TED speaker Clay Shirky points out, when information is produced by these social media channels “it can leak out like wild fire”. Hot entertainment, politics, or tragic events are discussed immediately way before they hit magazines, newspapers, radio stations or local news channels.The internet has given us what Shirky refers to as the “many to many pattern”. A good example of the “many to many pattern” is our recent devastating flooding in Houston, Texas. Last week hundreds of stranded Texas residents sought help by posting on Facebook and Twitter. They tweeted their locations during the flood to emergency officials. Rescue missions were organized through existing and newly created Facebook groups. Event pictures and videos were posted which allowed the whole world to see the reality that Houston was facing as it was happening. Suddenly you have millions of Twitter users acting as producers. The really crazy change is here: the fact that former consumers are now producers. The development of the internet is amazing. To think that the last time we had a major hurricane was in 2005 and Twitter did not exist at that time. The people in Houston found dialing 911 was not the solution to get help. They used Facebook, Twitter, and Nextdoor for help. Officials did urge people to use all sources because as much as social media can help, it can also hurt as well. There have been reports of year old pictures and rumors being posted and spreading just a fast. So the need for mainstream news sources and weather reports will still always be important. 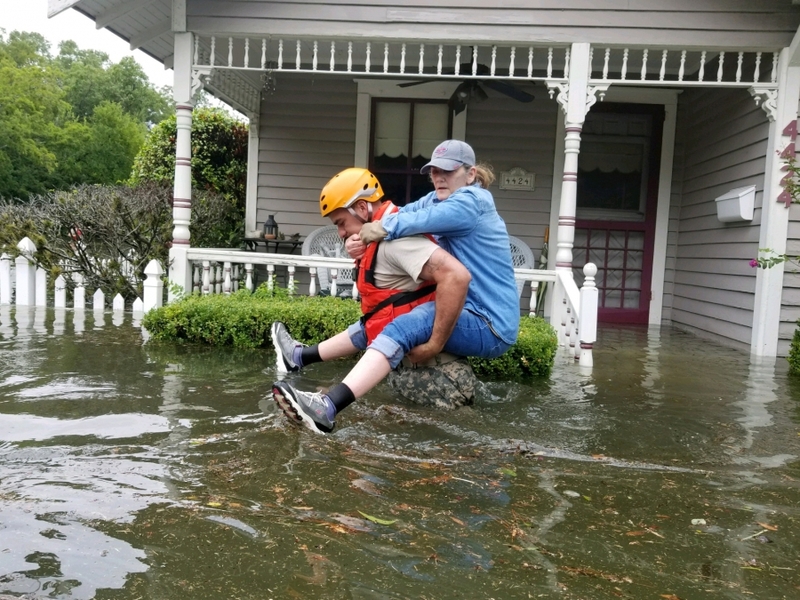 As this tragic flooding event continues, social media platforms from Reddit, Twitter, to Instagram have been flooded with requests for rescues. Nextdoor, which is a popular social media site for neighbors said it has seen an unusual amount of users in the Houston area. Although pictures and video footage can not fully describe these events, we will have much more information to react to these tragic situations. Our media landscape will not only continue to change history, but will create many more opportunities for population dialogue where people can look back and learn from past events. There will be more exposure of personal narratives. I believe it is these trends Clay Shirky highlights in his TED Talk that will continue to lead to more opportunities and educational growth.